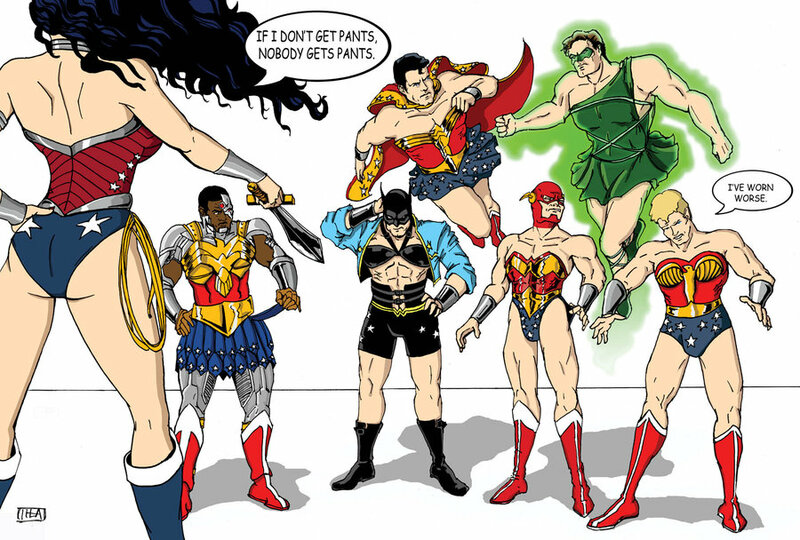 A while back, I posted another artist’s depiction of sexism in Wonder Woman. As her art shows, it’s not only the clothes, it’s the pose. And finally, remember, sexist superheroes lead to sexist LEGO sets. For sake of keeping it light — thought you’d like this, Margot. For a great look at the incredibly powerful real women behind the film portrayals of Wonder Woman and Xena, and how they deal with the sexism in their industry, check out the documentary “Double Dare.” It’s about the stuntwomen who portrayed Wonder Woman and Xena. Seeing these women do what they do is entertaining and inspiring. The film is by academy award nominated Bay Area filmmaker Amanda Micheli, who herself is a kickass woman. I think it’s what you make it. I remember a lot of girls in the schoolyard making “bracelets” out of cardboard tubes, and tiaras out of cut-up file folders…none of them stripped down to their underwear before running around on the schoolyard pretending to be WW, feeling all powerful. The female yard duty teachers encouraged, or were encouraged by, all this. The show was a hit, female power was in the air, hey, it was the seventies. How come your daughter didn’t say “Why don’t the other superheroes go capeless, like she does?” I agree the gravity-defying bustier is stupid, but aside from that, her costume looks like someone expecting to do battle, in gladatorial style. You know, in keeping with her origins. It’s one of the most sensible costumes in the Justice League, which might have something to do with why WW has consistently been among the most respected and prominent characters. Why not pick on Power Girl? Or — this is a pet peeve — Supergirl? Have you seen what they’re doing to her lately? Always the bare legs. Nobody ever seems to want to pick on Wonder Woman where she’s got it coming: The poorly-defined powers, the unsettled origins, does she have a secret identity or doesn’t she, that lame jet, the silly villains.